Ryan’s first season with the band is 2018 at the age of 16. 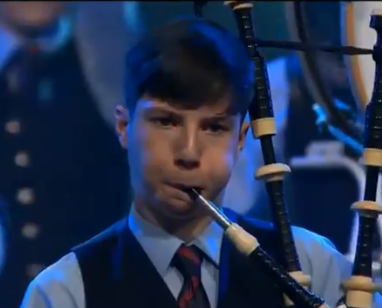 Hailing from Newtownards, Co. Down, Ryan began piping in 2009 and has received tuition from Pipe Major Caldwell Hamilton at the Cleland Memorial Pipe Band, his father Glenn, Glenn Brown and Chris Armstrong. In 2015 Ryan played with his father and Uncle Robert in the Pipes and Drums of the PSNI before following in his father’s footsteps to join FMM in October 2017. Ryan has won 7 All Irelands titles and 5 Ulster titles in solo piping and recently gained two seconds at the Adult Northern Ireland Piper of the Year.